How do I become a Flying Blue Member? It is free to join Flying Blue, and can be done in just a few minutes. We'll give you a Membership Number straight away. You can enroll online now. Do I need to join Flying Blue to earn Miles while shopping online? Yes. As long as you're a Flying Blue Member and have logged in and clicked on the retailer site, you can earn Miles. Can I purchase and earn Miles while shopping online if I am not a Flying Blue Member? Anyone can browse the site, however you must be a Flying Blue Member to purchase and earn Miles. Can I earn Miles if I am not a Flying Blue Member? No. You must be a Flying Blue Member to earn Miles. Is it more expensive to shop via this website? 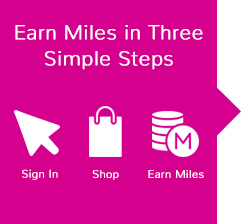 No you will not spend any more by using our site – and you'll get the benefit of earning Miles. It's the same price as shopping directly with the retailers however by using our site you can earn Miles on every purchase. And our service is totally free. My Miles have been awarded at a slightly lower rate than expected, why is this? Many retailers deduct postage and packing charges and the tax elements of a sale, before calculating how many Miles you earn. I signed into my Account and made purchases via the website, but my sales aren't showing up in my Account - what's going on? It may be that the web browser used at the time of purchase had cookies disabled. Cookies allow us to track your purchase – without them there's no way for the system to allocate Miles to your Account. Make sure you login at earnonline.flyingblue.com using your Flying Blue Account Number and PIN and click on the 'Shop Now' button to access a retailer. Don't click on another banner or website promoting the retailer before you complete your transaction. If you must visit another site before completing your purchase, please use a different browser to do so. Interrupting the browser session that you started can affect tracking. Don't use a promotional discount voucher other than those displayed on the website, doing so may cause the referral to come from the code issuer rather than the website. Increasingly some advert blocking software programs are blocking the special tracking codes we need to track your purchases. I have contacted you about missing Miles for a purchase, how long can I expect to wait for my Miles to appear? Each retailer will need to review the transaction details you have provided us (Name, Address, Flying Blue Number, Order value, Order Number) and determine if this is a valid sale. Most retailers review all missing transactions in detail and it can take up to 90 days for a retailer to contact us about and confirm your purchase. Sorry no, we're unable to retroactively allocate Miles. The next time you shop, always visit the retailer's website via the Flying Blue shop for Miles Website at earnonline.flyingblue.com so that cookies can track your visit and we can allocate Miles. When you buy something, the transaction will appear in your Flying Blue Transaction History as 'Pending' within 5 working days. We'll then confirm the transaction with the retailer before updating the transaction status to 'Approved' and adding Miles to your Account. This takes up to 45 days (or 90 to 120 days after you've completed your stay for hotel or travel bookings) and is subject to the retailer's Terms & Conditions. Some retailers and purchases can on occasion take longer but we will always try to get retailers to approve as quickly as possible. The Flying Blue shop for Miles Website will clearly outline how many Miles you'll earn. In most cases, this will be expressed as a number of Miles earned per Euro or your local currency spent. For example, if a retailer is offering 2 Miles per Euro spent, and your transaction total is EUR 50, you can expect to receive 100 Miles. In another example, you may not earn Miles per Euro spent, but rather certain number of Miles for a single purchase, or by registering for a service with that retailer. In this instance, you'll receive Miles for that one action, but not for subsequent actions or purchases on that retailer's site. Can I see my Flying Blue Transaction History online? When you buy something the transaction will appear in your Flying Blue Transaction History as 'Pending' within 5 working days. It's our retailers who decide the level of Miles given for shopping with them. There's an online shop I visit frequently, but it's not part of the Flying Blue shop for Miles Website. How can I get it added? We're constantly adding and looking for new retailers, so if you know of a great online service or shop that you'd like to see added to our growing list, please contact us. From time to time retailers may decide they no longer wish to participate in Flying Blue shop for Miles Website and fund Miles for our Members. When this happens, we bid them a fond farewell and remove them from our listings. Can I use my Miles to redeem? Can I purchase products directly from the Flying Blue shop for Miles Website Retailers with my Miles? Can I exchange my Miles for cash? No. Once Miles are credited to your Account you can redeem for Award Travel or other Redemption options, but they cannot be exchanged for cash. Visit store.flyingblue.com to find out more. Do the Miles in my Account ever expire? As long as you have a qualifying activity every 20 month your Miles will not expire. Your personal info is kept completely confidential. Flying Blue will not share any personal information about you with our retailers. However please note though that when you click a 'Shop Now' link to a retailer, you will leave the Flying Blue environment completely and be subject to that retailer's Terms & Conditions. If you leave your details with a retailer, they may contact you. A cookie is a small piece of data used by web servers to help identify web users. Cookies can be turned on and off by you at any time in your web browser menu. Cookies allow Flying Blue to award your Miles for any transactions with retailers. How are cookies used at the Flying Blue Earn Online Website? Forgot your Flying Blue Pin code or membership number? Where will Flying Blue online retailers deliver to? We have hundreds of retailers currently on our site covering a vast range of shopping categories and we are always adding more!